Did you attend summer camp as a child? Have you ever sent your own children? 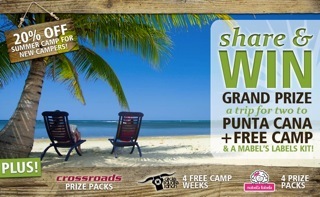 Circle Square Camp and Pioneer Camp are both holding great contests to give away free camp sessions, Mabels Labels packs, Giftcards for Crossroads and the grand prize, a trip for two to Punta Cana! BOTH camps are giving away the prizes so enter on both! The contest is open to Residents of Canada Only (Except Quebec) who are 13+. Those 13-18 must have parental consent to enter and to redeem prize. Full contest details including explanation of prizes and when they will be awarded are here. The contest dates beings March 21, 2012 at 12:00 a.m. Eastern Time (“ET”) and ends on June 15, 2012 at 11:59 p.m. ET. It is a Share and Win Contest which means after you enter, you should share about the contest with your unique PURL link. You will receive another entry into the contest for every person who enters via your link. You can share via twitter, facebook and email at the touch of a button, or email it to yourself to get your PURL link to copy and paste into other networks. 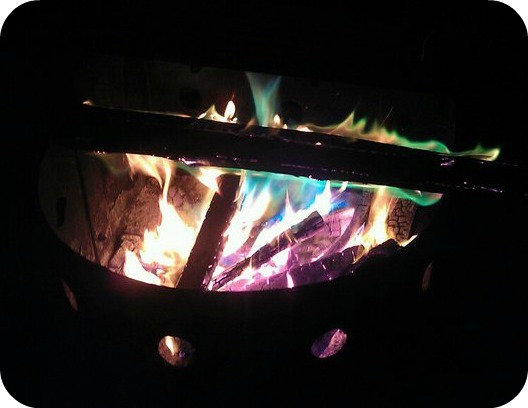 So why should you send your child to an overnight camp? I have not attended any of the Circle Square Ranch camps but I have always gone to Girl Guide camp. As a leader I do unit camps throughout the year but I also volunteer for summer camp for one week. When I was 9 I attended summer camp for the first time. I cried every night for my mom but I had a great time. I never actually wanted to go home because I knew I would miss all the fun. So I quietly cried till I fell asleep and then woke up and enjoyed the next day. As a leader my children have camped since before they were born (in utero) so I hope that they will enjoy going to camp, even without me and when they are old enough, they can go off to summer camp too.